These are a Beautiful trio of miniature ceramic liqueur bottles, made by the Alpho Pottery, France circa 1930’s. A Wonderful set, owing much in its design to the Art Deco / art Nouveau period, when Alphonse Mouton started his studio. Born in 1900 into a family of potters, this prolific potter worked in Saint Vallier in the Drôme region in south west France from the 1930s to 80s. He produced mainly for the tourist market using a series of recognisable glazes in colours ranging from dark blues, greens and beige. He also produced some items for liqueur companies. 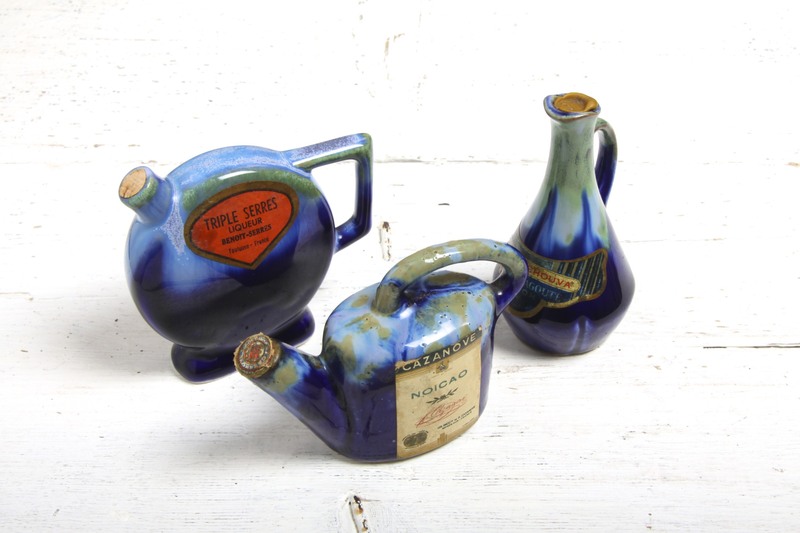 These are Great examples of his work, displaying characteristics of Art Deco in the angular handled bottle, Art Nouveau in the tall slender bottle, and playfulness in the teapot / watering can shaped piece. All with variations on his characteristic glaze in a dripping / flamelike effect in shades of blue and green, with different textured glazes on each. Perfect to add to any Alpho / French pottery / European studio pottery collection and would complement any Art Deco / Art Nouveau / 1930’s / 40’s, French style, rustic or contemporary styled interior. All marked differently, one marked ’12 ALPHO’, another impressed mark ‘5’, and another unmarked other than the distributors stamp ‘Benoit Serres Toulouse’. In Excellent Condition, no marks, chips or scratches or crazing, some wear to the labels commensurate with age, nothing to detract from the vintage look. Measuring from largest: 10 x 9 x 2.5cm / 4 x 3.75 x 1in. 10.5 x 5 x 5cm / 4.25 x 2 x 2in. 10 x 8 x 4cm / 4 x 3.25 x 1.5in. They still all contain their original contents! But for overseas buyers please note that they will have to be drained prior to shipping!